Earth Weave Carpeting: Did You Know? Founded in 1996, Earth Weave was the first carpet manufacturer in the United States to introduce a running line product that incorporates only 100% natural materials. Earth Weave's Bio-Floor™ carpet is completely different than any of the other wool carpets made today that are full of claims to be eco-friendly and natural. Those products are full of synthetic chemicals whether it is the non-organic face yarn dyes, mothproofing, stain protection and/or in the synthetic styrene butadiene adhesive backing. Chemicals are not healthy. Earth Weave knows this and now you do too! There are a few importers of carpets claiming that their line of wool carpets are made using untreated wool. If you actually call them and press them on it they will reluctantly admit that they do put mothproofing on the wool even though all of their literature states otherwise. What does 100% natural mean? I am chemically sensitive; will your products work for me? How soft are your carpets? How do you get your colors? I have heard that wool carpets shed. Is this true? How are you different than any of the other environmentally friendly carpet companies out there? What is your stance on the three R's (reduce, reuse, recycle)? Isn't it better to use a recycled carpet? Are your products LEED certified? Why should I use your product instead of a synthetic carpet that will provide me with the same amount of LEED points at a lower cost? 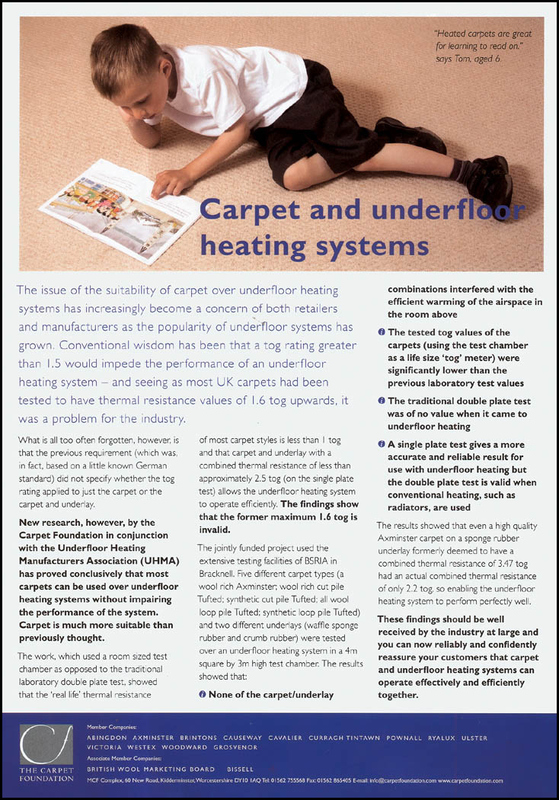 Can your carpeting products be used over a radiant heat floor? Can I buy your wool pad to use under my carpet from a different manufacturer? Does your product require hand sewing or special installation procedures? Are your carpets durable? How long will they last? How does one clean your carpets? Do you manufacture area rugs in addition to wall-to-wall carpet? Do you have a brochure you could send? Do you ship to a residence? Do you manufacture carpet tiles? Earth Weave starts by using only pure wool. Our new pending OrganoSoftColors™ line uses organic dye; there are no dyes applied to our other four styles. All styles use no pesticides or stain protections that are commonly used by the other wool carpet manufacturers. The application of these chemicals would greatly affect indoor air quality through the off gassing of volatile organic compounds. The primary backing that we use is also an industry-first combination of hemp and cotton. We chose to use the hardy hemp fiber, due to its durability, strength, and mold and mildew resistance. Our all-natural primary backing is specifically designed to be used in our biodegradable flooring and is exclusive to Earth Weave. Our carpet padding is a is a blend of coarse naturally pigmented wool mechanically needled (not glued) together to create a luxurious, healthy cushion. The padding is free from dyes, fire retardant, glues, moth proofing or adhesives. This 100% natural wool padding will provide many years of service before needing to be replaced. When it does, we urge our customers to recycle it to the garden where it will safely biodegrade while serving as an effective weed barrier and mulch. Over a period of 2-3 seasons the padding will completely disappear, adding nitrogen and other nutrients plants need to the soil, essentially returning to grass. Earth Weave has developed a unique product that maintains all the criteria of those looking for the purest, least toxic floor covering available. Bio-Floor™ can be used without reservation to provide the utmost in comfort and durability while maintaining indoor air quality and your health. While we have many customers that have had a great experience with our carpet, we cannot guarantee nor comment on any individual/client's reaction. It is up to each individual to decide on their own if our products work for them in their environment. No warranty is made as to individual reactions, physical or otherwise, regarding this carpet and its effects. Where does our wool come from? We use British Wool due to its excellent crimp and fiber characteristics. The breeds we use are the finest available. The sheep are raised in a free range environment. They are outside in all types of weather, both harsh and pleasant. This dynamic environment causes the sheep to grow a very hardy fleece that allows us to produce the highest quality carpeting. Through all the elements, durability reigns supreme. The colors are derived from the wool as it is naturally grown on the sheep's back. Just as you, your family and friends have a specific color of hair, so do sheep have unique colors based on particular breeds. We take these naturally colored fleeces and blend them to achieve the beautiful colorations of our carpeting. When we do use dyes they are organic (coming soon). No non-organic dyes or harsh chemicals (moth proofing) are applied. It is true wool that carpets shed a little. This is due to their being made from short "staple" fibers. In fact, all staple fiber carpets shed a little. Many synthetics carpets are made from staple fibers. Staple is really anything that is not continuous filament. The only natural fiber that is continuous filament is silk. Of course, silk would not be as durable as wool for use as a carpet fiber. In spite of the shedding that occurs with all staple carpet products, you can be assured that it is minimal and will in no way be noticeable in the appearance or durability of the carpet. You may notice small fibers in your vacuum cleaner if you were to inspect inside the collection bag. This is typical and is no cause for alarm. Many companies are just "green washing" the public by touting to recycle and/or use recycled products. We do not feel that synthetics are sustainable, and are therefore not "green/eco". We are committed to 100% sustainable resource floor-coverings and will not manufacture a product from petrochemical resources. This would include the "recycled pop bottle products" gaining popularity today. Even though these products are marketed as environmentally friendly because of their recycled origins, putting pop bottles into floor-coverings halts the recycling process. The fact is, virtually all consumer floor coverings go to the landfill after their useful lives have expired. We feel that to be truly green a company must be sustainable and offer a truly healthy product. By having healthy, sustainable products that are naturally based, the planet is replenished at the end of a product's lifecycle. This is true recycling! Bio-Floor™ is 100% bio-degradable and if taken to the landfill will decompose just as trees, brush and grass clippings do. The nutrients then go back into the earth to be used in whatever way mother nature sees fit. From Nature To Nature™. We are very serious about the environment and protecting it through the proper implementation of the THREE R's. We do everything we can to REDUCE waste—whether electrical or physical. Earth Weave's twist on the reuse and recycle part is that we feel these are best accomplished through Mother Nature. Since the beginning of time, nature has been able to perfectly "REUSE" natural materials that are discarded into the environment. Although there is no waste in this system, the nutrients most often do not replenish Earth in exactly the same state. As an example, leaves fall to the ground, bio-degrading to become nutrients for all sorts of living plant life. Of course the nutrients are therefore RECYCLED into the natural world. It really is a perfect system, but it depends on healthy, natural raw materials at both the input and output stage. Buildings are LEED certified, NOT products. Our products do meet criteria for accumulation of LEED points. The difference is our focus on health, first and foremost. In a word, HEALTH. This is one of the main failures of the LEED program. In a lot of cases, it does not reward, or in fact encourage, the implementation of truly healthy sustainable products. This is an area where a lot of "green washing" has taken place. It seems that the large corporations have been able to influence the program to meet the criteria of the products they produce instead of the other way around. It is not like this in all cases, but if one looks closely, these shortcomings are quickly evident. Environmental health and planet welfare are about more than accumulation of "points" and who has the most money to influence policy. Definitely! We have favorable data from testing results when carpets are used with radiant floor systems. This is real-world testing in an actual room-size test chamber. The data validates what we have always known, and of course this is great news to our customers that want the comfort/softness of healthy, non-toxic wool carpet instead of a hard surface floor covering. Click here for research findings. Sure you can use our pad with carpeting from a different manufacturer, but you should consider why you would do this. Many companies have products that they will describe as "natural" or in a "natural collection." Look closely, and you will find a synthetic backing in the carpeting. If you are looking for the healthiest carpet/padding combination, it does not make sense to put a natural wool pad under a synthetic-backed wool carpet. You should just use a synthetic-based padding product. Please refer to our Carpet Construction Page. No, hand sewing is not required with our products. If you have an installer that can sew the seams and you prefer that method, there is nothing wrong with it. It is generally more expensive to sew the seams, and that is the main reason we do not suggest it. We suggest that you find a competent installer that has experience with wool carpeting and has access to a low/no VOC seaming tape. Your installer will find that our carpets install very nicely because they do not have the stiff synthetic fillers in them like all the other products out there. Many of the synthetic flooring manufacturers would have you believe that wool carpet with jute backing is not as durable as the products they make. This is simply untrue. In fact, our healthy wool carpeting has a "useful" life of 20–25 years before it needs to be replaced. Typical synthetic residential carpets will need to be replaced about every 7 years. The synthetic carpets do not wear out per se, they just "ugly" out. Meaning they are no longer aesthetically pleasing to look at. They will however stay around in a landfill for an extremely long time. Some estimates are that they will be around for at least 10,000 years. Durable materials (Earth Weave's healthy wool carpeting) require less frequent replacement, generate less waste, and actually generate lower long-term costs. Having such a long useful life will reduce the cost per year as well the carpeting's impact on the environment. The main benefit, though, is that you will not be introducing synthetic styrene butadiene and have three additional exposures. How do you clean our carpets? We suggest customers use Host Dry Carpet Cleaning. These can be found at www.hostcarpetcleaning.com. As with all quality natural fiber carpets, vacuuming with a suction only vacuum cleaner is recommended. Beater bar vacuum cleaners may damage the surface pile of wool carpets. Proper vacuuming on a regular basis will increase performance. Use only wool-approved cleaners for removing stains. Do not vigorously rub the affected area. Lightly blot area instead. If stain persists, contact a professional cleaner and be sure they use cleaners designed for wool and natural fibers. Yes, we manufacture area rugs using the same natural yarn that is used on the face of the carpet to serge the edges for a high-end look. This edge finish is durable as well as being more elegant than the binding procedures some manufacturers implement. Earth Weave was founded in 1997. This was well before the new wave of "green business." We are not a new fly-by-night company nor one of the growing numbers of carpet manufacturers that are jumping on the "green" bandwagon. Please look closely at these other manufacturers with regards to what they produce in addition to their "green" lines. You will often find that they are a large conglomerate producing synthetic products. Also, be aware that "green" does not mean healthy. Please see: What does 100% natural mean? Being an environmentally responsible company, we do not believe that it is eco-friendly to do excessive printing of a paper brochure. We have complete information on our website and believe this will give our customers the most thorough understanding of our product offerings. However, there are samples that are available through your retailer. We feel that a physical sample better represents our carpeting than a printed image. Of course, you may at your discretion print any of the pages from our website but we do ask that you please consider the environment before doing so. We can ship to a residence, but we suggest shipping to a commercial address, such as your dealer/installer. We suggest you coordinate the details with your retailer as they can help you make the best decisions for your situation. As you may imagine, carpeting is a large and bulky item and therefore best handled by a professional that is familiar with the receiving process. We have a 5-year manufacturer's defect warranty. Natural fiber carpets vary in texture and color. Slight variances in texture and color are normal and do not constitute a manufacturing defect. Matting, crushing, soiling, staining or any other changes in appearance are not considered manufacturing defects and are excluded from this warranty. No warranty is made as to individual reactions, physical or otherwise, regarding this carpet and its effects.